A Security Administrator within an Organisation enables security related configuration options on an Azure Tenant to implement security controls that align an organisation with Microsoft recommendations and best practice. The Azure Security Score provides an evaluation on the alignment of an organisation with best practice, however to some extent it still requires end users to have the right configuration for security related elements of their profile. 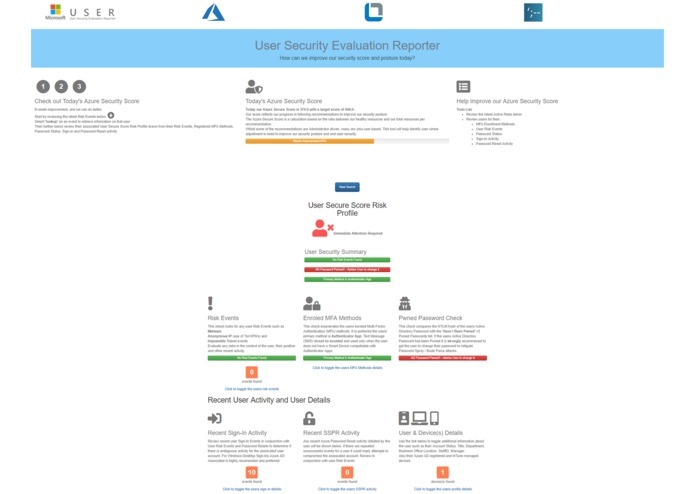 But as a Service Desk Operator or Cyber Security Officer there isn’t a single view of a user’s security posture that can give you an individual user security score summary. What is the base user information for that user and what devices are registered to that user? Is the device Azure AD Joined? 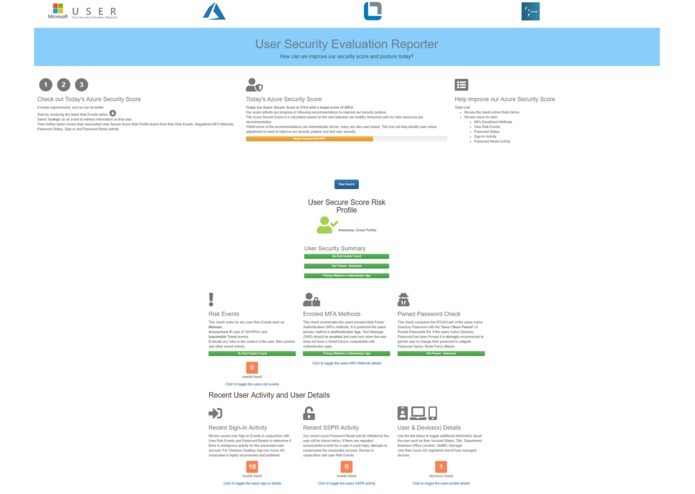 Visual feedback/guidance is given for the retrieved user based on the configuration of the security options or risks associated with their profile. Likewise, any user in the environment can be searched for and returned. When a Service Desk Operator receives a call for a user they can use Microsoft USER to search for and retrieve that user. Does the user have multiple accounts (Hybrid (AD and Azure AD), Cloud Only and/or B2B)? What is the users recent activity? As part of the call with the end user the Service Desk Operator could configure the users AD/AAD account to require a password change on next logon if their password has been Pwned. They can advise and talk the user through changing their primary MFA method to use an Authenticator App over SMS. They can see if the user has been having problems using Azure Password Reset and why that maybe failing (e.g fuzzy password violation). They can also review the recent logons for the user and if the user’s Windows Desktop isn’t Azure AD Joined they can talk the user through doing that. Through everyday use of this tool as part of end-user interactions by the Service Desk Operators and Cyber Security Officers, the Security Posture of end users calling the Service Desk or those who are being flagged with Risk Events can be improved. Continuous improvement of end user security posture will also improve the Azure Security Score for the organisation enforcing and aligning with the configuration implemented by the Security Administrators. Recently I've had customers that are looking to improve their security posture. However they don't have visibility of individual users existing posture. Likewise when investigating an event there isn't a single view that gives a 360 degree view of a users security posture. 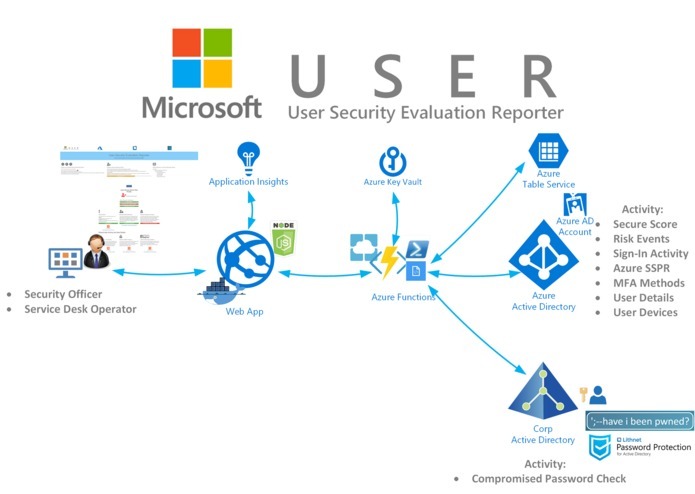 This Microsoft User Security Evaluation Reporter solves these problems. Creating my first Docker Image for a WebApp and pushing it to my first Azure Container Registry and deploying it to Azure App Service. A User Security Evaluation Reporter developed as my first ever WebApp built in NodeJS integrating with Azure Functions and Microsoft Graph that runs in a Docker Image on the Azure App Service.